Hiring an unqualified home inspector can be disastrous for you as the buyer. It could even lead to the seller canceling the transaction. There are steps you can take to ensure you are working with inspectors who are professionally qualified. These can include asking for credentials at the outset and reviewing a home inspection report they have created for another buyer. The problem is, few states regulate or license home inspectors, which makes it difficult to differentiate between the competent practitioners from the less so. Know how to protect yourself from hiring an unqualified inspector. Choose a certified inspector. There is no shortage of home inspector associations. One of the best known and oldest organizations is the American Society of Home Inspectors. You can also ask friends for referrals or ask your real estate agent for a recommendation, but in either case, research the inspector's qualifications. Some inexperienced agents recommend inferior inspectors because they don't want a full-blown inspection that could hamper their deal. Reputable agents demand qualified inspectors because they want their buyer to be informed. Inquire about errors and omissions insurance (E&O insurance) as well. This is intended to protect the inspector and the client against losses that occur because of an oversight on the inspector's part. A good home inspector should agree to send you a sample report. If the assessment is only a few pages long, don't hire that person. While report lengths may vary, comprehensive inspection reports average between 20 and 50 pages and should contain color photographs highlighting defects or problems. The report details conditions of the home and what repairs need to be focused on. A good home inspector will be thorough and accurate. 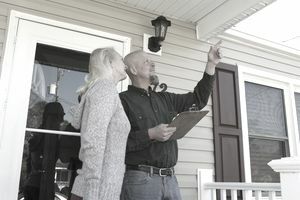 Home inspectors are in the business of inspecting homes. If a home inspector offers to direct you to a contractor to work on repairs, that inspector could be creating a conflict of interest. If a home inspector takes it upon himself to recommend repairs, liability issues may ensue. Some state regulations and inspector associations allow an inspector to undertake specified repairs, but unless the inspector can present qualifications to do so, it's in your best interest to keep inspections and repairs separate. Repairs should be handled by licensed contractors that can be warrantied. Most home inspections take between two and three hours, and sometimes longer. You have to take into account the size of the home, the number of systems to be inspected, the number of electrical and main panels, the condition and age of the property, and so on. But you should always ask. Anything below that average would be the equivalent to a gloss-over inspection. The best-case scenario would be for you to attend the home inspection, even if it's just for the last 30 minutes. Let the inspector walk you through the home to point out defects. Use this opportunity to ask questions about minor and major action items If the inspector can't answer your questions thoroughly, you're dealing with someone who may not be qualified. By attending the inspection, you are also ensuring you're getting your money's worth.